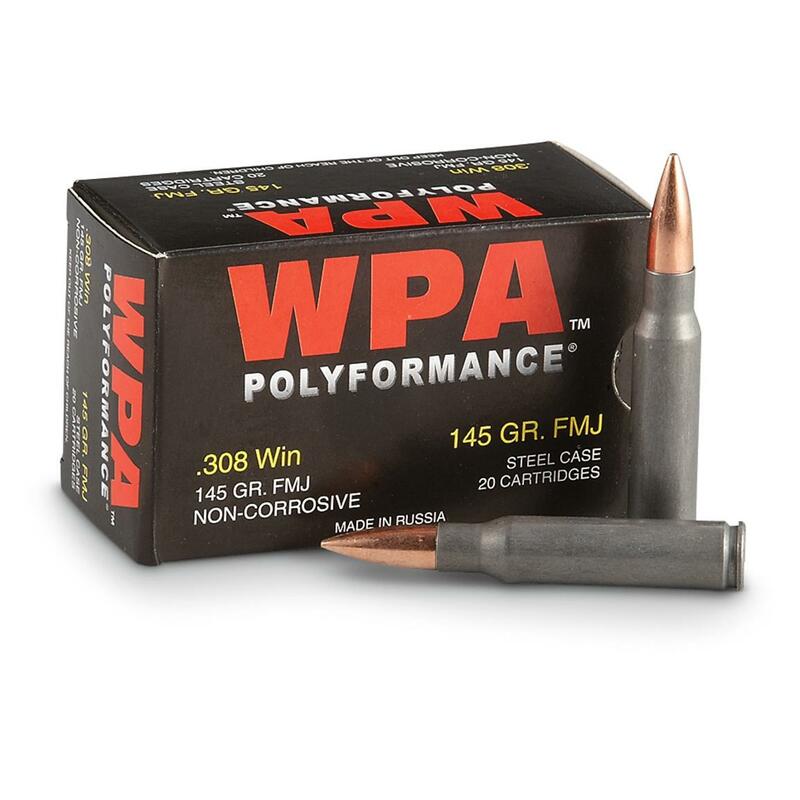 Stay sharp by hitting the range with accurate, affordable Wolf® Polyformance .308 Ammo. Delivers performance you can count on at a price that makes sense. Wolf Polyformance, .308, FMJ, 145 Grain, 500 Rounds is rated 4.6 out of 5 by 38. Rated 5 out of 5 by PLL_can from Example: Great Price! My FN FAL and Cetme eats this ammo up. Shoots a bit dirty though. But a good cleaning never hurts. Rated 5 out of 5 by Ronin01 from Great price, great quality... Period. Used to sight in a C308. Once sighted in, realized this "cheap" ammo was running smooth, no failures, and providing close to 1" MOA. Wouldn't have believed it if I had not seen it myself. Rated 5 out of 5 by uncfolife from Great Ammo Great deal on the ammo with free and fast shipping! Rated 4 out of 5 by Richard from Decent Target ammo Good stuff for dinkin' around at the range ! I wouldn't use it for a 1,000 yard match at Camp Perry ! But for blasting targets at the local gun range,it is just fine.It shoots a little dirty,but I don't care ,I clean my gun after every shooting session. At $180 ,free shipping for 500 rounds,how can you go wrong ? Rated 5 out of 5 by dave19113 from Great Surplus Ammo Love this as surplus ammo. Shoots MOA in my Ruger Scout 308. Its definetly not match ammo, but for the price its great. My PTR 91 loves it too. Rated 4 out of 5 by gymheart from Of all the 308 ammo I've tried, this shoots the best in my CA C308, FN clone. Right around 1 1/2 3-shot groups. yes, at 100 yards from a sand-bag rest. Would have given 5 stars if it weren't such a pain cleaning up after this dirty Russian powder. Rated 5 out of 5 by 1Jim from Amazingly Good Cheap price, amazing in my T/C Compass rifle..Groups at least moa..T/C guarantees "moa accuracy out of the box with quality ammo"...well this must me "quality ammo" because mine does it with this.Consistent "BANG", none weaker nor too much BANG and seems plenty powerfulI'm very impressed. Rated 3 out of 5 by Polecat from Average Ammo, Average Price If you know what you're buying, it's not a bad deal. You're not gonna shoot bull's-eyes at 1,000 meters with this ammo, but you're probably not going to have to take out a loan to buy it either.